I make art primarily for myself and to show my friends so I guess it's important to make art that they can connect to. Image size: 21½ x 33½"; paper size: 29½ x 40½". Edition 25. Image size: 31½ x 21½"; paper size: 39½ x 28½". Edition 25. Soft ground etching with spit bite aquatint printed on gampi paper chine collé. Image size: 8 x 6"; paper size: 13 x 10". Edition 25. Soft ground etching with spit bite aquatint on gampi paper chine collé. Image size: 5 x 6½"; paper size: 13 x 10". Edition 25. Published by Crown Point Press and printed by Em. A portfolio of twelve soft ground etchings with spit bite aquatint printed on gampi paper chine colle. Image size: varies; paper size: 13 x 10". Edition 25. “Dzama, it might be said, has always been a poet of conclaves, of invented worlds governed by their own rules and codes of behavior,” wrote Deborah Solomon in Marcel Dzama: Puppets, Pawns, and Prophets, a catalog for the 2013 exhibition at David Zwirner Gallery, London. In his art, Marcel Dzama composes stories with twisting narratives and symbols of our cultural history and contemporary reality. He conveys a sense of nostalgia, morality, and theatricality through a cast of characters in a magical, mythical, and cultural world. “I like imposing order on chaos and turning it into a grandiose opera,” Dzama has said. Born in Winnipeg, Canada in 1974, Dzama has been drawing as long as he can remember. Inspired by comic books as a child, he struggled with dyslexia and liked the illustrated versions of literary classics. In 1994 as a student in the School of Art at the University of Manitoba, Winnipeg, he regularly was sent to the Winnipeg Art Gallery for class assignments. During those visits, Dzama was exposed to the museum’s Inuit collection whose mythological scenes and shamans in animal costumes inspired his art. In 1996 at the start of senior year, a fire at his parents’ house destroyed all of his belongings and artwork. The fire allowed him to start anew. He was given a studio at the Art Barn, a university building, and began to develop his figurative, pen-and-ink drawings that have, as Solomon wrote, “the chaste, innocent aura of storybook illustrations but attest to the sad abusive undersides of societies and institutions.” With a muted palette of khaki greens, beiges, and browns, Dzama creates characters for his worlds. Napoleonic officers, centaurs, acrobats, cowboys, and Joan of Arc are some of the characters that mingle in Grand presentiments of what must come (2012), a large drawing based on a painting by Francisco de Goya. His use of appropriation has become a recognizable characteristic of his art, and he pulls iconography not only from popular culture but also from artists, including Hieronymus Bosch, Francisco de Goya, and Marcel Duchamp. While Dzama initially became known for his labyrinthine illustrations, in recent years he has expanded his art to include collage, sculpture, painting, video, and diorama. Dzama also has established an acute interest in collaboration. In 1996 with Michael Dumontier, Jon Pylypchuk, and other friends, he formed the artist collective the Royal Art Lodge in his university studio. The members communally created art signed only by a date and rubber stamp. A 2003 exhibition at the Drawing Center in New York brought the Lodge to an international audience. Since then, Dzama has collaborated with artists, writers, choreographers, and publishers. “I prefer collaborations to solo work,” he has said. “There’s more energy. You’re bouncing ideas back and forth.” In 2015, Dzama worked with artist Raymond Pettibon, each developing the other’s compositions through illustration, collage, and writing. This resulted in the 2016 exhibition Forgetting the Hand at David Zwirner Gallery, New York. Dzama also designed the costume and stage design for the New York City Ballet’s The Most Incredible Thing that premiered in February 2016. He collaborated with choreographer Justin Peck and composer Bryce Dessner to adapt the performance from the Hans Christian Anderson fairytale. Marcel Dzama has been represented by David Zwirner Gallery since 1998, and he had a solo exhibition of three hundred drawings there in the spring of that year. He has since exhibited widely in North America and Europe, and a major survey of his work was presented at the Musée d’art contemporain de Montréal in 2010. His work is in museum collections internationally, including the Corcoran Gallery of Art, Washington, D.C.; the Museum of Modern Art, New York; the National Gallery of Canada; and the Tate museums and art galleries, London. In 2015 he made three large prints and a portfolio of twelve etchings at Crown Point Press, San Francisco. Dzama has lived and worked in Brooklyn, New York since 2004. 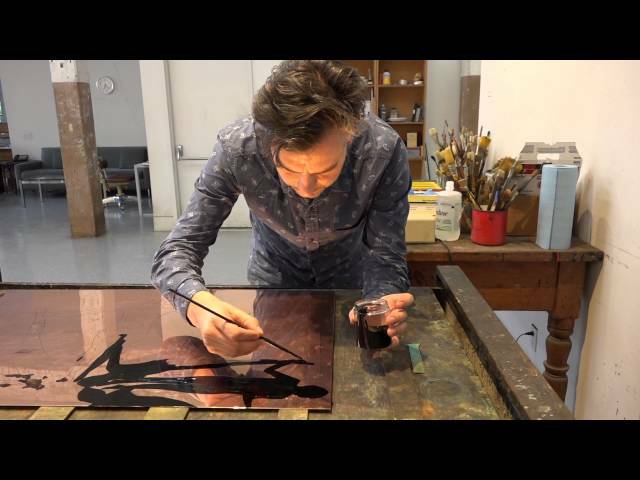 Marcel Dzama narrates a short video showing him in the Crown Point studio using spit bite aquatint and soft ground etching on copper plates.